Remember those sweet little vintage Meyercord decals we were all sticking to everything chippy a few years back? They used to be so popular that I’d have to pay around $12 a sheet. Today, I find them often for under $5. I’d been thinking about using them in a pendant and today decided to experiment with something I’d never crafted with, a penny. Now, before you nail me on the legalities of defacing US currency, I did an exhaustive search on the subject and feel that my project is well within the law as I am not altering any coins for fraudulent purposed as defined by law. So, that being said, (and with due respect to our late president Lincoln,) I went to work with a hammer and a screw. Why not a nail or drill, you ask? Ok, people, you should follow me around in a day. I grab what’s closest and this screw was sitting there in the garage looking sharp enough. 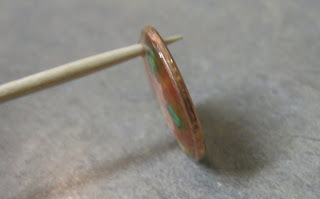 I hammered a hole from both sides of the penny on a piece of wood and gave the penny a few more whacks for good measure to flatten out any warping that occurred in the process. I placed the penny over a slice of wine cork cut to keep the penny from being glued to the foil lined pan once baked and dusted it with Amazing Glaze embossing powder. I placed the penny in the toaster oven to melt the powder. 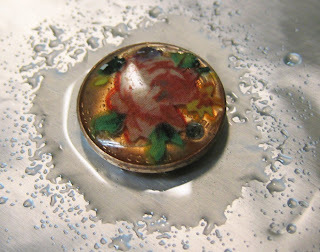 Once cooled, I began soaking a small decal in warm water to remove it from its backing. 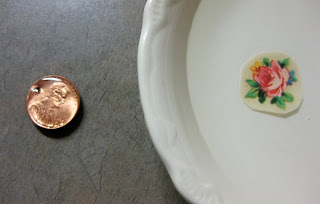 I slid the decal onto the glazed penny, patted dry with a paper towel, and turned it over to trim with my Xacto blade any extending pieces of decal. I dusted the decal with Amazing Glaze and popped it back in the toaster oven to heat. Before the piece was cooled completely, I twisted a toothpick into the hole to keep the glaze from plugging it up. And here is the finished decal penny pendant, jump-ring attached, being modeled by my lovely daughter, Sarah, in her jammies. 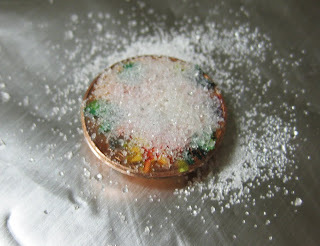 I also experimented with spray painting a penny, adding the decal and then baking with the embossing powder. A few strange things happened, bubbling paint, cracking decal, but I thought in the end it looked kind of chippy chic. UPDATE: Click HERE for a more recent link to the project done by tweenagers! This entry was posted in Uncategorized and tagged diy, diy jewelry, meyercord decals, penny jewelry, vintage decals. Bookmark the permalink. This is great! 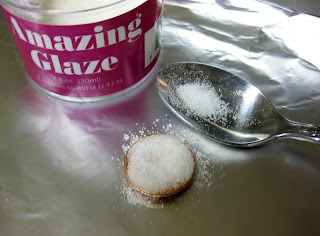 I am so picking up Amazing Glaze Embossing Powder this week…it is on the list for sure! Amazing! Tell me though, are you sure there are no hallucenogenics involved in your creative process? I can't figure out any other wasy to get all that vision from one human brain. Hurray! Now I know what I'm using my Michael's coupon for this week..Amazing Glaze..can you use a heat gun instead of the oven? One of our mottos around here: "Any tool can be the right tool." 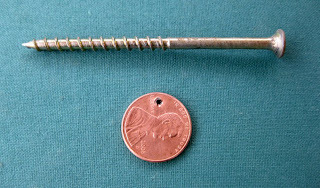 Of course a screw can be used as a drill! I Have to try that!! I'm always saving the 'lucky' pennies I find on the ground.. I think I'll have to get some polish, shine them up, and turn them into pendants! CUTE!! I had to chuckle when I saw your post. If you look at my blog today, you will see those decals incorporated into wall art in our booth pictures! How fun! I would love to see the other results too ! you are AMAZING! Thank you so much for sharing your WONDERFUL & CREATIVE ideas! 🙂 Have a GREAT day! I had no idea about Amazing Glaze. That is a fabulous idea you have! Great idea using the decals. Now I know what to make for a fund raiser for our dog show next year. thanks much for the tutorial. These are amazingly cute!! I'm so taken aback by your never ending creativity!! Thanks for showing us how! What a great idea! It turned out so pretty and unique. What is it like to live with a brain that is CONSTANTLY coming up with such unbelievable ideas? BTW, I've never heard of Amazing Glaze—-where do you find it? Thanks again & Mad Men is #1 for me, too! Thanks for all the super nice comments everyone! I purchased my Amazing Glaze online. There's a link in the text of the post, I'll go back and make it in color so you'll know where to click. You may be able to find it locally, but if you order online, buy lots. It's addicting stuff! this is so cool! it looks so easy. thanks for sharing! I just love your blog! It's very inspirational and creative, and I'm spending too much time here (LOL)! 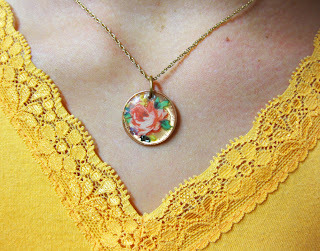 What a great looking pendant (both ways)! Thanks for showing exactly how you did it. I love that. How very creative. How inspiring. I think it's funny that you said that about the screw and hammer. I am the same way. I think it's so funny that we'll just use whatever's there instead of spending 2 minutes getting the "right" tool. C'est la Vie. Oh, my goodness, you are FULL of cleverness!!! I would never have thought of this in my wildest dreams….I MUST go find the Amazing Glaze! I've never heard of Amazing Glaze. What a wonderful creation. I've seen old coins made into necklaces with a hole drilled in them so I would think you are ok. I would imagine they just want to make sure someone doesn't find a process of making pennies look like dimes or quarters look like dollars or something like that — or who knows! I bet you've started a new rage! Love that idea! Wow, these turned out awesome! I don't need anything else to do [I already do too much]. But I am definitely passing this on. Thanks for posting. Wow, those are so beautiful! I really like how they look in the past photos against the yellow. Gorgeous! Thanks so much for yet another fabulous idea, I'll be linking. You kind of rock, you know that? These are gorgeous. I love them. I featured this on somedaycrafts.blogspot.com Grab my "featured" button. This is absolutely phenomenal! I like both — the chippy one is pretty darn cool. Hope you won't be mad I shared a link to your blog in the etsy forums. We had been discussing the powder but none of us had tried it yet. where do you get the decals? You can find vintage decals on Etsy, eBay, flea markets, etc. I found several at an antique store. I made a bunch of these for Christmas – they turned out so cute! The decals turned out to be really hard to find, so I went with some rub-on stickers from Robert's Craft (still really hard to find). I tried to use a nail to make the hole, but in the end, the screw actually worked better! Thank you so much for such a great idea! OH. MY. GOD! Cathe I've been browsing your blog for the past hour and am TOTALLY inspired! This is the PERFECT project for all the random loose change I have from past travels. Thanks for sharing your brilliance! I can't wait to see your new projects for the new decade…. This is such a cool tutorial. I am very glad I got to read it. MHG!!.. I never see something like that. Look Fabulous! Cool Idea. I submit your link to my blog. Wow..it's beautiful and thanks for the sharing. I'm not sure i can get those materials in my country or not. L-O-V-E this. Holden, you're a genius! Thanks for linking to our shop for purchasing Amazing Glaze! We also have a free Amazing Glaze tutorial on our site – click here to view and download! Wow! this project is lovely and for those who are worried, I think that as long as you don't try to spend the U.S. currency after defacing it you can do what you like. It is my understanding that it only becomes an issue if you try to spend it after the glazing/decaling. Not that you'd WANT to! 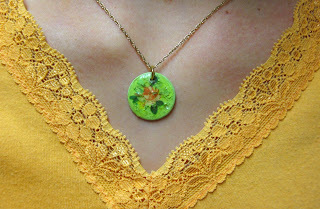 Thanks for linking to us, Cathe, we all love your blog here at Ornamentea.com! I love this idea so much! You've made my Fan Fridays on crossxmyxhooks.blogspot.com! I really want to try this project and I've found a new supply i need to purchase: Amazing Glaze Embossing powder! I was wondering if anyone has tried to put any kind of pictures other than decals on the penny?? What a super tutorial! I shall link in a future blog post so readers can come and check this out! I am wondering if you could use a temporary tatto decal??? I believe it is along somewhat of the same??? I’d love to know where you found some tiny Myercord decals like you used on the pennies. I can’t find them anywhere. That looks cool and relatively easy. Can I buy that embossing “stuff” at Michael’s or JoAnn’s? I see a summer project with my daughter and maybe her friends, a la bday party on the horizon!!! Thanks for the wonderful ideas. 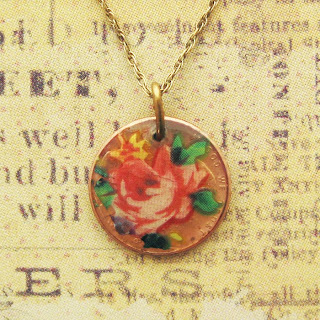 Love this penny one and will try and make it soon. I cannot seem to get it right and if little girls can do it I cant understand how I keep getting it wrong! When I heat the embossing powder, it dries all bad on the backside. Do you have any tips to help?? I loooove this project! I made these as gifts for my bridesmaids and they were a huge hit! I used tissue paper instead of the decals and they came out awesome…through some trial and error, of course. Thanks for the idea Cathe! I LOVE LOVE LOVE these! I want to make them as little birthday gifts for the girls in our youth group… I will look for pennies that were made the year they were born. Thanks for sharing! I am actually looking for something to use for a zipper pull. I recently purchased some (longchamp totes – though they are not original …still nice) except, the zipper (I can live with), but, they used a large rather cheap round brassy ring to pull the zipper. I thought if I purchased something other than the brassy ring to pull the zipper…it would upgrade the look of the tote. Do you sell your charms? Any suggestions would be greatly appreciated. If I don’t have a toaster oven, can I use a microwave? 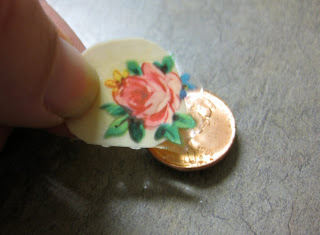 what a cute way to turn a penny into something really pretty. i will be trying this tomorrow. Where do you get your decals? I just came across this on Pinterest and I am thinking I’ll use this technique for some Christmas ornaments this year! 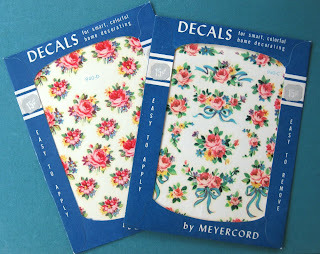 I don’t see Meyercord Christmas decals and since I’ve never used the product, I’m not sure what else will work. I see in the comments that someone used tissue paper and someone else suggested tattoos- any other ideas? I can’t wait to give these a try! When I was a little girl growing up in the 50s, I can remember my mom putting decals on everything! You went to the dime store and picked them out of big books like todays wallpaper samples, and most packages were only 25 cents for an entire sheet. Thanks for the great memory. Cute idea! I have some of those decals left over from another project! I like this idea a lot, yet I have to put my twist onto it of course.. So I started by pounding the pennies flat so that you couldn’t really tell they were once pennies. 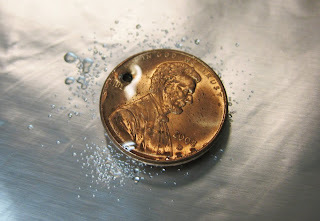 Then I used my 2 size wing-nut punch and punched a hole into them effortlessly.Next I put them in my vibrating tumbler and cleaned them off (along with a few non-pounded pennies that were so dirty, a few necklace chains and other coins). Then I got out my diamond glaze, cause that’s what I have, and looked through my images and stickers, etc. and found a few I likes. I also used the flattened pennies for letter stamping and wrote a few things. So this way I had several of each idea. I will keep on experimenting with this idea and thanks so much for getting me started. Love this craft! Just bought my copper bead necklace and connectors. However, for the jump rings, what size should they be?? I was wondering what temperature to set the oven and how long to bake?